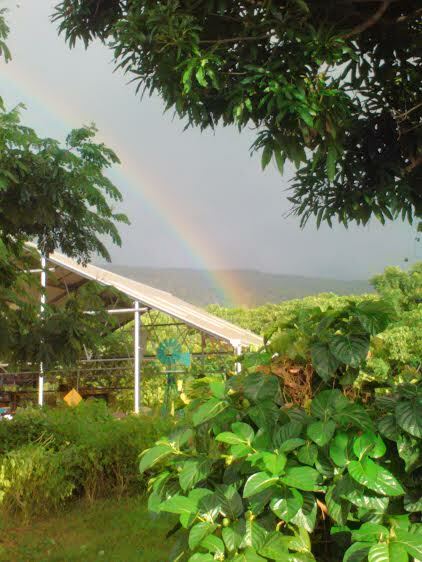 One Island is a non-profit rural community development and education organization affiliated with LAUGHING GECKO FARM located in South Kona on the Island of Hawaii. The Laughing Gecko site is a 10 acre diversified, organic, agroecology working farm that is testing and developing soil and water conservation solutions for lava rock conditions, planting and maintaining tropical, subtropical and exotic fruit orchards, working towards a market garden economic foundation through vegetable, herbs, fruit, medicinal and spice plantings, and is bringing 6,000 square feet of greenhouse into market-ready operation. Farm features include medicine wheel, spice forest, cacao and mango groves, pollinator habitat, native and canoe plants, and a kukui grove that spans the property, top to bottom, creating a forest habitat. We are developing on site, closed loop compost and input solutions to promote food security. The Farm offers stewardship work and learning opportunities with short term farm stays for US and international visitors. As a field study site, the farm offers a variety of hands-on learning laboratory experiences for self-directed learners interested in a full immersion in tropical living, close to nature, and with nearby recreational, natural history, archaeological and Native Hawaiian experiences. In the tropics, about half of the stewardship activities are spent maintaining the organic grounds, compost systems and building soil, the other half are spent on developing, harvesting and preserving food crops. In addition to the farm activities, the site has also served in the past as a community hub for food, health, art, renewable energy and related sustainability programs. One Island has worked since 2005 to offer educational classes, workshops, film showings, forums, planning meetings, grants writing and social entrepreneurship programs that benefit all ages and abilities of participants. The non-profit’s community service work now takes place off site, out at community partner sites, while the farm is concentrating efforts on organic local food production. In collaboration, Laughing Gecko Farm and One Island host periodic volunteer gleaning, CSA connection, school garden, and youth day camp community service learning opportunities in support of reclaiming our local food system.